Experience the delights of a frontier kitchen garden and hands-on cooking demonstration featuring fresh vegetables and wild Alaskan seafood. Cooking demonstrations in Skagway begin with a chef-guided hunt for edibles and flowers from the award-winning kitchen garden. You'll see where the greens and spices at your table come from and learn how to cook your own gourmet Alaskan meal. Visit Olivia's organic restaurant in Skagway and take part in a new culinary experience with friends or family. You'll help cook a four-course meal starting with collecting ingredients and finishing with a fresh, delicious Alaska specialty. Learn how to make smoked salmon linguine pasta, fresh Halibut chowder and the famous Baked Alaska. Enjoy wine pairings, Alaska roasted coffee, herbal tea and other beverages while you follow along with the chef. Once your meal is complete, you can take the recipe home with a seed packet to begin your Alaskan garden at home. 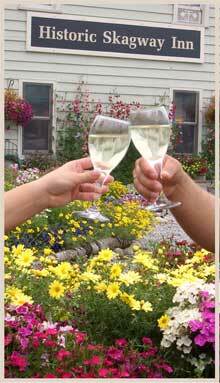 Learn more about the organic restaurant and luxurious bed and breakfast in Skagway. Call today to book your stay and reserve a spot at the cooking demonstration.